“`Google’s latest Google Doodle is celebrating what would be actress, director, and producer Mary Pickford’s 125th birthday. 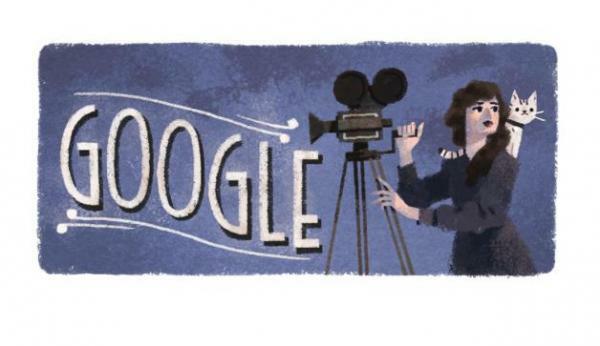 The search engine’s homepage features art depicting Pickford, known as Queen of the Movies, operating a camera with a kitty perched on her shoulder, and the word Google written in the style of text from a silent film. “`Mary Pickford was born in Toronto, Canada on April 8th, 1892, and she died in Santa Monica on May 29th, 1979 at the age of 87, after a prolific career in the motion picture industry. Early in her cinematic career, she was known as the girl with the curls; a beloved star who appeared in as many as 50 films a year in the silent film era. “`Mary was able to use her stardom to negotiate wages equaling half of her films profits, and demanded full creative and financial control of her films along with Douglas Fairbanks, Charlie Chaplin, and D.W. Griffith. Pickford also helped revolutionize the movie industry by developing the Motion Picture Relief Fund, which helped provide independent filmmakers an avenue to distribute their films outside of the studios system. “`She won an Academy Award for Best Actress for her role in the 1929 film Coquette, and was recognized for contributions to the film industry with an Oscar for Lifetime Achievement in 1976. This entry was posted on Saturday, April 8th, 2017 at 10:10 pm	and is filed under Blog by Manny Pacheco. You can follow any comments to this post through the RSS 2.0 feed. Responses are currently closed, but you can trackback from your own site.